In a previous blog we talked about creating new habits and routines to help you manage the onslaught of daily email. Now let’s talk about some specific strategies to fine tune your inbox. I’m going to address Gmail here, the most popular online email service, but most email software has similar functions. I recommend Googling a “how to” for your particular service or ask someone to help you. There is a concept called Inbox Zero, which advocates clearing your inbox every day. I don’t think that’s realistic for most people. However, a valid goal is to minimize the number of messages in your inbox. First, and most important, treat your inbox like an inbox. Don’t use it as a repository or storage bin for all your emails. Process email out of the inbox and into folders, the same as you do for any digital or paper document. Setting up folders is the single most important action you can take. Second, and this is almost as important, don’t save all your email. In fact, you could probably delete most of it. If that gives you heebie-jeebies, just move it out of the inbox. In Gmail, you can “Archive” email messages. Archiving moves the message out of the Inbox and into All Mail. If you have labelled a message, it will still show up in that folder, but will no longer sit in the Inbox. In Gmail, folders are called Labels. There are two ways to create a label. If you select a message by clicking on the little box to the left of the message, a menu bar appears next to the “More” button. Click on the drop down next to the label symbol and you get a list of labels already created. At the bottom of the list is “Create new.” Click on that and a box will appear for you to write your new label name. If no message is selected, you can click on the dropdown next to the gear symbol at the top right and click on “Settings”. Then click on the “Labels” tab. 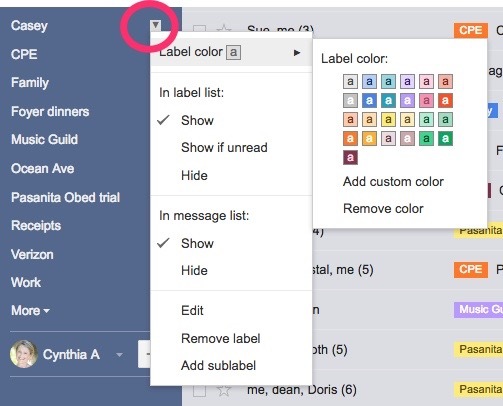 It will display the System labels (labels that come with Gmail), the Categories (big tabs next to your inbox), Circles (of your contacts), then Labels, where you can create, hide, remove, edit all of your labels. 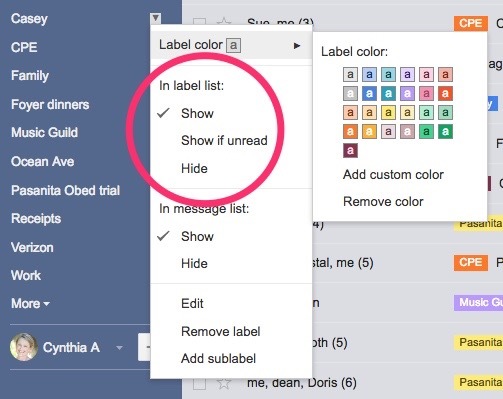 Now here’s the cool thing – you can color code your labels so they pop in your inbox. 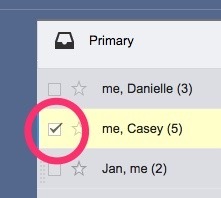 I just created a new label “Casey” for emails from my friend Casey. The label shows up on the left sidebar under COMPOSE. If I hover on that label, I get a new drop down menu where I can pick a color for the label. Now the message pops with a bright green label. The next thing I can do is make a rule that all emails from Casey will go into the Casey folder. Gmail calls rules Filters. I go to the Search bar and click on the drop down for an Advanced Search. 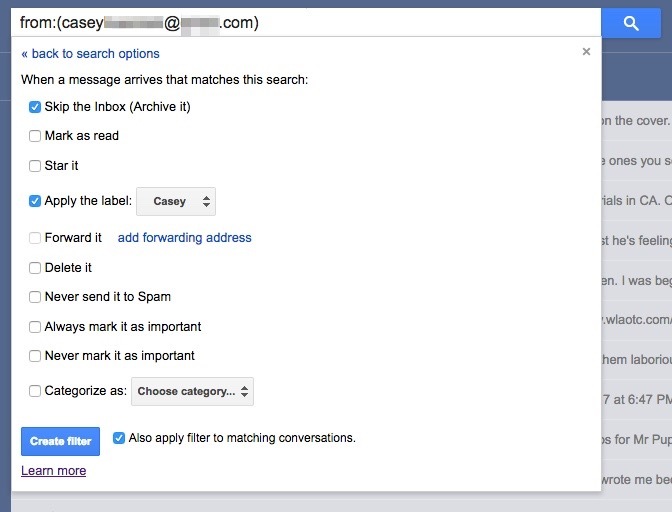 I put in my criteria – all mail from Casey – and then click on the “Create filter with this search” at the bottom right. I can have the message from Casey skip the Inbox and go straight to her folder, and I can have older messages that fit the criteria do the same. 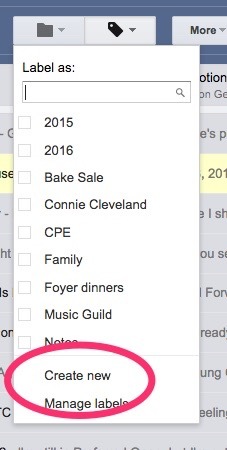 The great thing about labels in Gmail is that one message can have multiple labels. Now that your inbox is manageable, what about the backlog? What do you do about all those old messages that may have information you need? My recommendation is if it is more than a year old, you probably don’t need it. 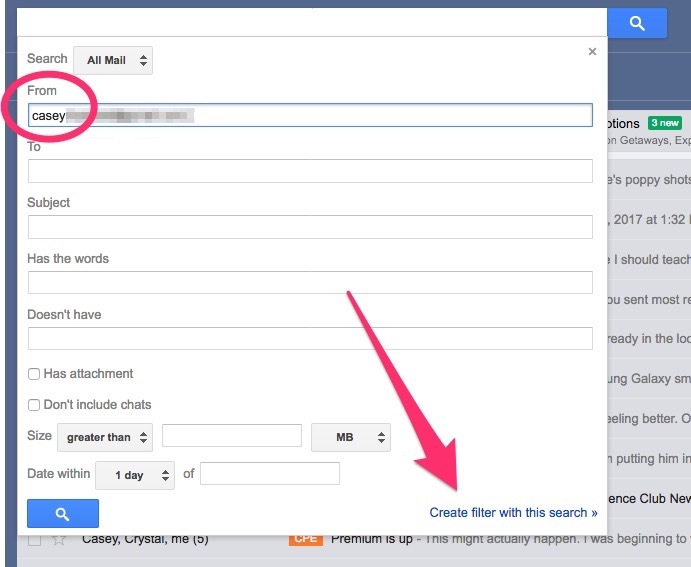 You can use the Advanced Search function (click the dropdown in the search bar), or simply select all emails in a date range and delete. For more recent messages, creat a new folder – 2016 – and archive all those messages into the folder. When you have time, process them bit by bit until you’ve cleared the folder. What about attachments? In a word, detach! Attachments are discrete files sent to you via email. If it is information you need to keep, detach and save them to your computer or phone. It is inefficient to search for a document by rummaging through emails. In a subsequent blog, I’ll talk in more detail about digital file management. The important thing is to save it to your computer and rename it in your naming convention so you know what it is.